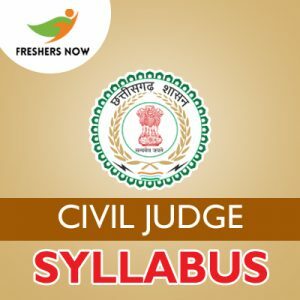 Get all the detailed information of the CGPSC Civil Judge Syllabus 2019 from this page. However, the officials of the Chhattisgarh Public Service Commission (CGPSC) are ready to commence the examination tentatively in the month of April 2019. So, candidates who have applied for the 39 Civil Judge posts must and should note down the छत्तीसगढ़ लोक सेवा आयोग Civil Judge Exam Pattern, the latest CGPSC Civil Judge Selection Process from the below sections. Moreover, we have also attached you with the subject wise CGPSC Civil Judge Exam Syllabus 2019. So that every participant can start their preparation. Download link to get the psc.cg.gov.in Civil Judge Syllabus 2019 PDF for free is available to the end of this page. Check this section to get the latest CGPSC Civil Judge Selection Process 2019 given the officials of the Chhattisgarh Public Service Commission (CGPSC). The final selection will be on the merit basis of the total marks obtained in the Written Test that is Mains Examination and Viva Voce. The decision of the CGPSC with regard to calling the candidates for the Viva Voce will be final. The maximum of 15 marks is fixed for the Viva Voce Test. In this section, one can find the exact information about the CGPSC Examination Centers. The officials of the Chhattisgarh Public Service Commission (CGPSC) is planning to conduct the examination that is Preliminary, Mains only in the allocated centers. So, we have listed such centers as below as per the examination. Note: It is not necessary that the examination center opted by the candidates will be allotted to them. Looking to the capacity and the administrative convenience, the CGPSC officials will not allocate the exam center even other than mentioned or may delete any exam center in the given list. Also, candidates shall have to appear in the exam at the test center as assigned. All the candidates who are about to start preparing for the test must and should note down the छत्तीसगढ़ लोक सेवा आयोग Civil Judge Exam Pattern 2019 as given in the below table. Furthermore, the below table gives you the clear details of the Preliminary Examination, Mains Examination with the Viva Voce part. So, get this table and then include the assigned CGPSC Civil Judge Exam Pattern 2019 in your preparation. Besides going to download he CGPSC Civil Judge Exam Syllabus 2019, all the candidates need to observe the listed topics in which each examination holds. So that you can easily get through the update. Furthermore, we have specified the Paper I, Paper II subject that is required for the test. So, note down the topics as given and then start working on it. Also, you can find the direct download link to get the detailed CGPSC Civil Judge Syllabus 2019 in PDF format for free. And we have inserted the PDF for the official Examination Scheme to the end of this page. The Chhattisgarh Excise Act, 1915. Translation: English to Hindi (Maximum 10 Marks), Hindi to English (Maximum 10 Marks). So, soon after referring to this page, we hope that all you have downloaded the CGPSC Civil Judge Syllabus 2019 from the link given above. So, follow us on our webportal that is Freshers Now for more stuff and exciting news.